I hoped one day to visit Sweden. This wasn't a dream I had since I was young, but one that developed after I started researching my family history. My paternal grandfather came to Minnesota when he was a young child. He was born out of wedlock and his mother thought he and his sister would have a better life in the United States, as she was poor. So, they were sent to live with a family friend. My grandfather's sister never was very happy in the United States and went back to Sweden to live with her mother. 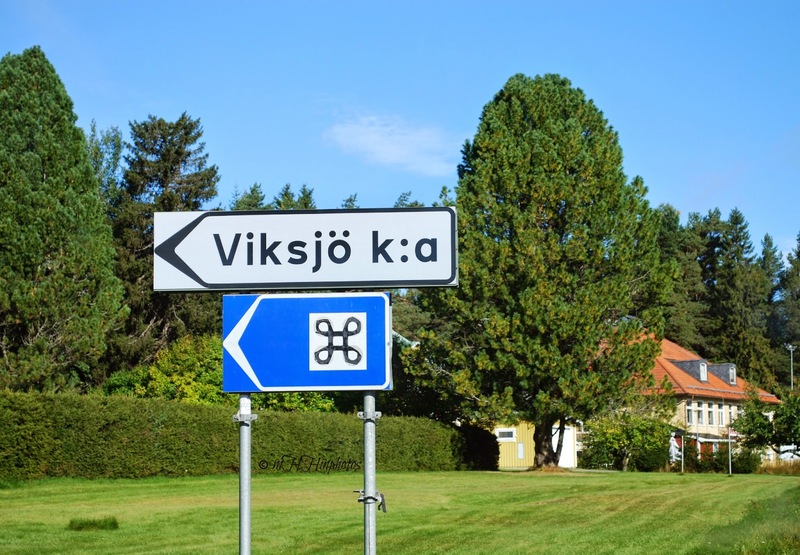 The area where they lived in was called Viksjö. It seemed to me a land so far away. About six or seven years into my family research I made contact with a family member who lived close to Viksjö. My newly found cousin thought he could help me learn more about my great grandmother Lundberg. His name? Jan Lundberg! I have heard a lot of rumors along the way about this line of my family, but I was determined to find out what was rumor verses truth. My cousin, Jan, who found me through my blog, eventually sent me a photo of my great grandmother's grave. 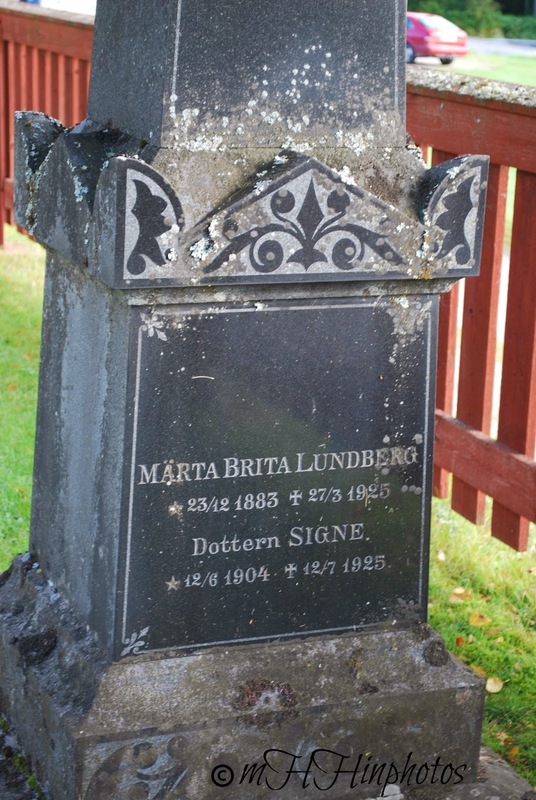 My grand aunt, or my great grandmother's daughter, Signe, is also buried in the same plot. It was wonderful to set eyes on a photo from Sweden with my family name on the stone. Still, it seemed so far away from me, in a land I had never known. Fast forward a few years…actually to last year. 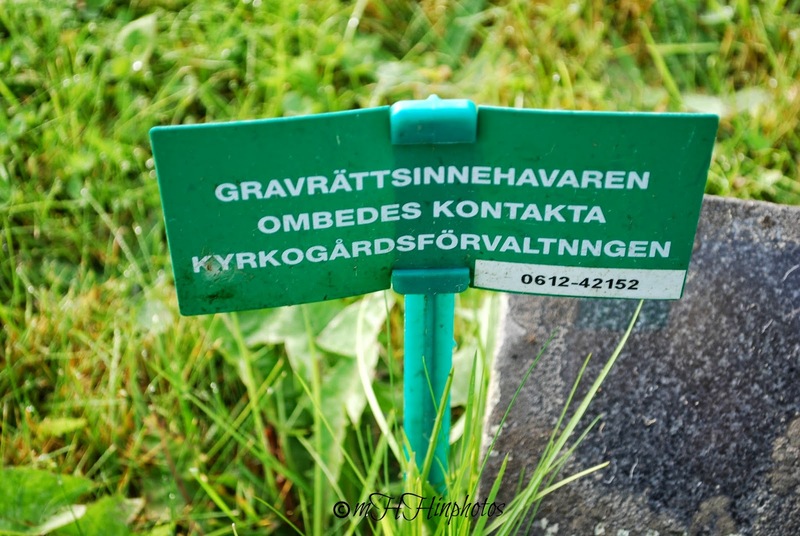 September of 2013 I stood on the cemetery grounds in Viksjö, Sweden. The photo above is part of the old church and grounds of the cemetery, which are extremely well taken care of. 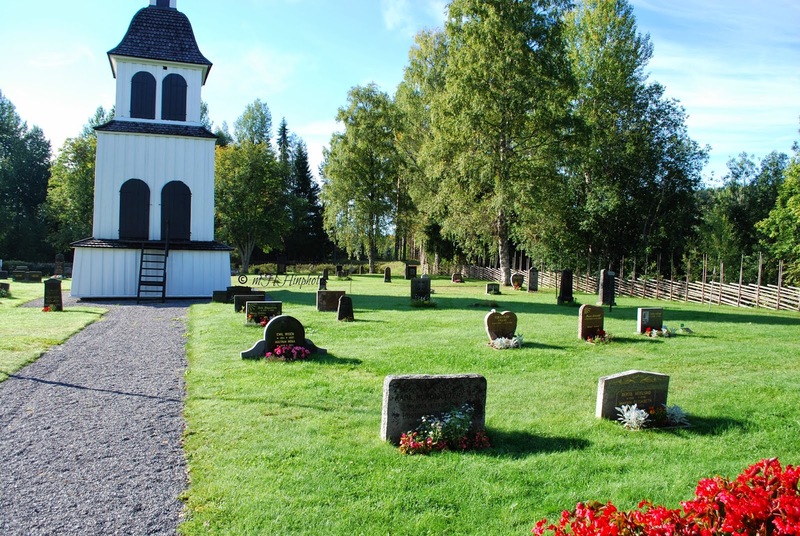 The photo below is on the other side of the church where the building with the bell stood and more of the cemetery grounds. Sweden, so green, so lovely. When we first arrived at the cemetery, Jan immediately took me to my great grandmother's grave site. He had, of course, been to the cemetery before, he had sent me a photo. He did go check it again before we arrived, to make sure everything was still ok I guess. He is so thoughtful! I thank him from the bottom of my heart. In the photo below, you can see how tall this particular stone is, it happens to be the tallest in the cemetery. Yes, it is the stone of my great grandmother and her daughter. As you walk through the gate this headstone is immediately to the right. Notice how close it is to the fence, that is where we entered. I was really surprised to walk through the gate, stop immediately and be at my grandmother's grave. How many times does that happen in real life? Then, I was stunned to actually see the height of the stone! Below is a photo of the name plate close up. The emotions that flooded me when I saw their headstone is beyond words. Never in a million years would I have expected to ever be standing in that very spot. I believe I was truly stunned. The comparison in size of the headstones in the cemetery with my grandmother's/grand aunt's was very surprising. I did not see a stone nearly as tall let alone taller than theirs. I found myself immediately questioning, who paid for this stone? My great-grandmother most certainly didn't have the money. I have theories about this, but no proof. There was a little sign in the ground to the right of the headstone. Of course, it was in Swedish so I didn't have any idea what it said. My cousin informed me, the cemetery grounds were requesting a family member call them. He told me he already called the number (thanks to his thoughtfulness to see the gravesite before we arrived) to see what was wanted/needed from the family. It turns out money was needed in order for the headstone to stay. Well, to me that was a no brainer. The tallest headstone in the place, and my family to boot? You bet it will get paid! I told my cousin I wanted to come home and talk to other relatives to get their feedback before I went ahead and paid for it. After all, I may be able to split the cost among a few of us, right? Maybe one day, another family member would like to see the tallest monument in the cemetery! I had roughly until the end of the year, 2013, to pay the fees, so not a problem, right? Note: My header has photos of my grandfather, great grand mother, and great grand aunt, in Sweden. 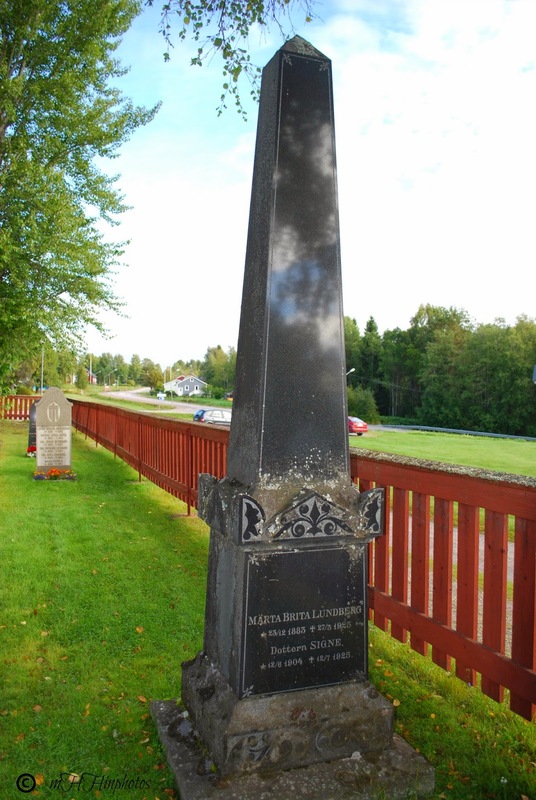 How simply wonderful that you were able to go to Sweden and see your great-grandmother's huge monument. It's lovely, as are all your other photos. I wonder what the cemetery would do if nobody paid. I mean, they can't just get rid of the stone, can they? Looking forward to your next part, and hoping some others went in with you. Thank you Barbara! My understanding is if the plot wasn't paid for they would use the plot for someone else, so yes, they would take down the stone. It will be a week or so until I write another post, I just can't seem to get ahead of myself these days, I have to write when I have time. Oh! How wonderful Cheryl! Congratulations on your trip of a lifetime to see Sweden, the homeland of your ancestors. By the way, I love the name of your very helpful cousin. My father's name is Jan as well. Thank you Jana! I wonder if your name derived from that also? This truly was a trip of a lifetime! 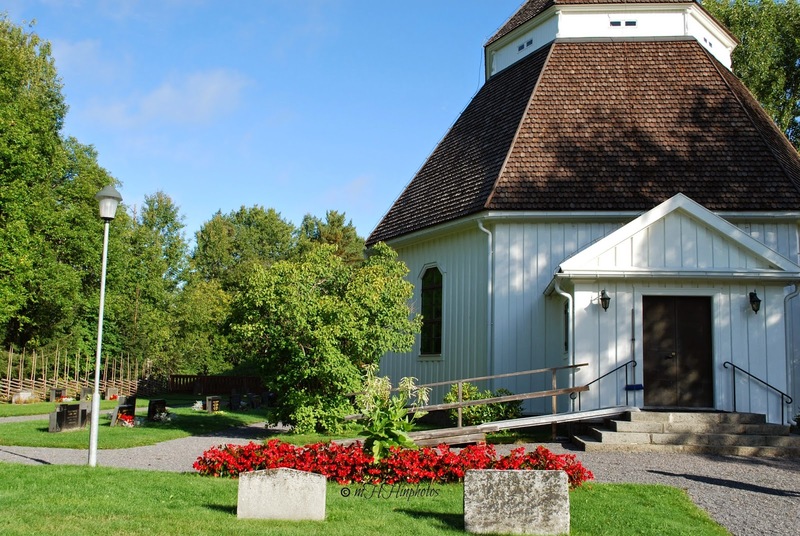 Hello, I just stumbled upon your blog while internet searching my grandparents' village of Viksjo in Sweden. I hope you see this message, 3 years after your post of your visit there. My great-grandparents are also buried in that churchyard. I was there in 1975, but could not locate the actual gravesites. Do you have any information you could share regarding how to contact the church sexton perhaps? 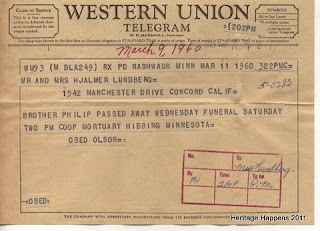 My grandfather's name was Daniel Oberg and my grandmother was Jenny Persson Oberg. My name is Jane Lott and my email is jane1753@yahoo.com Thank you!